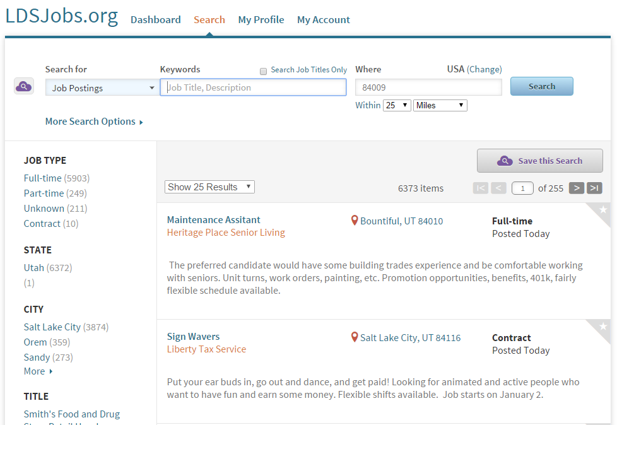 LDS Employment services offers a free and powerful web tool to assist in anybody’s job search. Because there are so many jobs posted on this site, it does not make sense for me to duplicate the output of a typical job search. Plus, I doubt a job search I performed would match your specific needs. 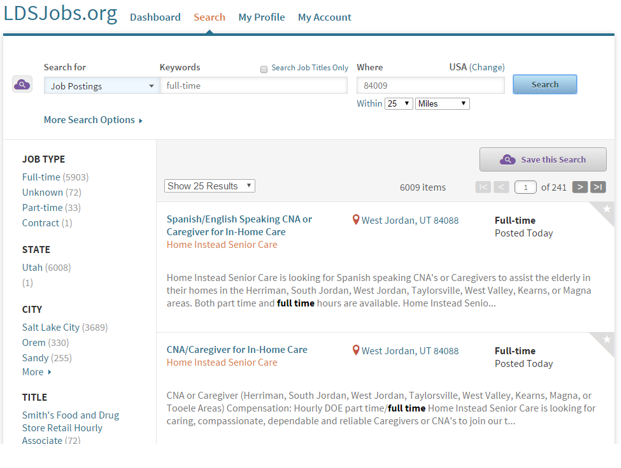 Now, when I say there are so many jobs, I started my search using just our zip code. The system came back with over 6,000 potential job opportunities. Of course, that is too much data to digest. So, I will provide instructions on how to access this site and show samples on how to restrict the floodgates of data to better help find the job best suited to your skills. If this is your first time on this site, click Click Getting Started to create an LDSJOBS profile. You will need an LDS.ORG account. 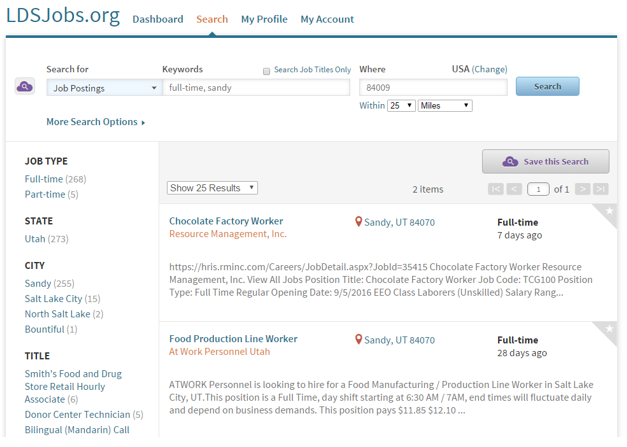 If you have already set up an LDSJOBS profile, click Sign in with your LDS account and the following will display. Click Sign In to display the following. Now you are ready to search. But in this case, the broad net approach resulted in over 6,000 jobs. If I want to catch an ocean of fish, then my net was broad enough. However, if I want to find a job, my net was too broad. 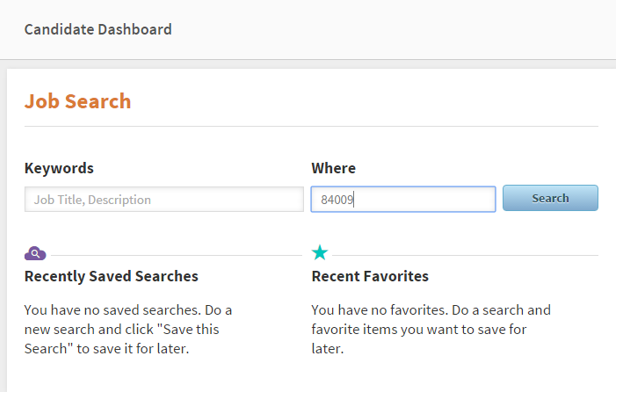 To narrow that search, I added Full-time in the Keywords box as shown below. That lowered my potential job search some, but not enough. 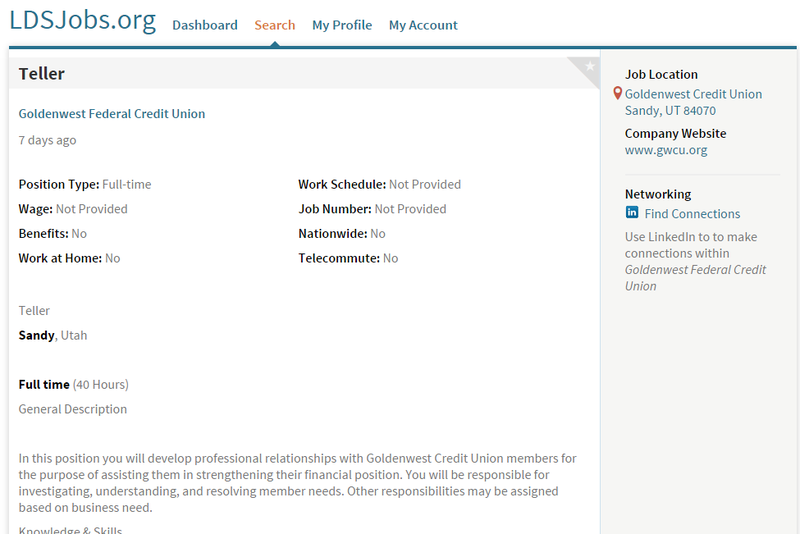 So, next added the word Sandy, That greatly targeted by job search to 252. Now only full-time jobs in Sandy are displayed as follows. To apply for the job, scroll to the bottom of the description and click the View Job on Company Website button. After clicking that button you are taken directly to the company’s web page and better yet, right to the specific job.